There's an awful lot of bad information floating around about driving in winter weather. In fact, you're probably doing it wrong. Yes, even if you're from New Hampshire. Here's how to drive on snow or ice without crashing your car or wasting money on unnecessary stuff. In my admittedly crackpot opinion, all-wheel drive is the greatest con ever perpetrated on the American people. It's tires, not the driven wheels that matter in snow. If you want a car that drives well in the snow, go buy a set of steel wheels and winter tires, then mount those in November and pull them off around April or so. You can pay for them with the money you save by not paying the upcharge for an all-wheel drive vehicle, the subsequently inferior gas mileage that vehicle will achieve and, you know, not crashing. All-Season tires are another con. Think of them as no-season tires. Your car's performance will be better at everything if you run summer tires when it's warm and winter tires when it's cold. Given that BMW, for instance, will charge you $1,500 for AWD on a 3-series, you can afford to buy winter tires if you want to drive in winter conditions by simply buying the equivalent rear-wheel drive BMW — it's the better car. It doesn't matter what kind of car you drive now; it will be a relatively capable snow performer if you fit it with winter tires. There's ample evidence all over the Internet demonstrating this absolute truth. But for those of you who consider yourself True AWD Believers (TM), I'll simply ask you this: how does AWD help when you brake? In these pictures, the Land Rover is fitted with studded winter tires. There were many parts of Iceland where that vehicle would not have been able to travel otherwise. That is not a dig on its capability — the Discovery Sport is probably the most snow/off-road capable crossover out there — but a testament to the efficacy of winter tires. Having said that, there are things a vehicle can have or do that will improve its winter drivability after you've fitted it with winter tires. First amongst those is stability control. Probably the biggest advancement in car safety since the seatbelt, it helps you avoid crashing in the first place by individually and cleverly actuating each brake on all four of your wheels to keep the car from spinning or sliding uncontrollably. If you've bought a car made in the last decade, it likely has stability control and you probably don't even know it's stepping in and helping out a couple times a day. In winter, the biggest help it'll give you is while driving in variable or unpredictable conditions. Let's say you're driving down the road at your normal speed and you hit a slippery patch of snow, ice, slush or whatever. It's stability control that will correct the resulting slide and likely keep you from spinning off the road, flipping down an embankment and dying. It really is magic and, unless you're a crazy classic car person like me, you should prioritize the presence of stability control over any other feature on any car you buy. Differentials: When your car goes around a turn, the outer wheels follow a wider arc than the inner wheels, meaning they're traveling a greater distance and therefor need to spin faster. So, your driven wheels are equipped with a differential that enables this difference in wheel speed. Most cars have open differentials which just allow a slipping wheel to continue to spin. Better cars will use a limited slip differential, which will recruit whichever wheel on an axle that has more traction to help out. A locking differential is operated by you, manually, and locks the speeds of both wheels on an axle together, greatly increasing traction in slippery conditions. Having said that, you should never use a locked differential when you have good grip as that wheel speed differential becomes crucial to safe cornering in those conditions. A locking differential may help you get out of a really slippery situation though; like if you get stuck. Traction Control: A lot of people confuse traction control with stability control. They shouldn't. Where SC actively takes control of your vehicle, helping to keep you on the straight and narrow, TC just kills power if the driven wheels spin up. This actually works against you in the snow, you need a certain degree of wheel spin while climbing slippery hills or similar. Anti-Lock Brakes: You know what these are and what they do. There are some expert-mode scenarios when ABS can work against you in deep snow — locking wheels and building up a berm in front of them can facilitate good stopping power in very loose conditions — ABS is standard on all cars now and shouldn't be disabled unless you really, really, really, really, really know what you're doing. You don't. Adaptable Electronics: Take the new Land Rover Discovery Sport, pictured here, for instance. Its Terrain Response System includes a snow mode which directs stability and traction control to allow a little more wheel spin while accelerating, simulates some locking in the rear diff and adjusts the AWD system to bias power to the rear wheels, where the weight transfers under acceleration, enabling more effective traction. That enables the Land Rover to operate optimally in winter conditions without the driver having to adapt their approach to them. Speaking of weight transfer, if you have a car that doesn't put much weight over its driven wheels — a pickup truck — then adding weight to that area can improve traction. Be careful not to throw heavy things in your vehicle that may fly around in an accident. Strap down any sandbags or similar securely, or simply opt for a purpose-made solution such as a water bag for your truck bed. Or just buy a car with good weight distribution. All-Wheel Drive: The general idea is that you've got four wheels, so they may as well all be looking for traction. That's a good idea! But, more often, "AWD" is simply a bandaid added onto a Front-Wheel Drive car to partially make up for its compromised dynamics. Rear-Wheel Drive being a superior solution in almost all-circumstances, of course. Think about it: your car's weight shifts rearwards when you hit the gas pedal and separating steering (accomplished by the front wheels) and motivation leads to less turniness in the driven wheels. Driven wheels work best when they're pointed forward. So, most AWD systems are just marketing hullabaloo directed at our country's largely ignorant car consumers. Sure, they can send 30 percent or whatever backwards, but it's still a FWD car in the vast majority of circumstances. And the same goes off-road, where again you may get some marginal benefit, but it's mostly just added weight, complication and cost combined with reduced fuel economy. Conversely, this new Discovery Sport may operate in FWD under normal circumstances, but it's a Land Rover, so it can send "almost all" of its torque to the rear wheels when required. That's part of what makes it what's probably the most-capable luxury crossover available right now. You'd never do the stuff pictured here in an Audi Q5 or BMW X3. Blanket: Go get a big, heavy wool army blanket from the surplus store. They're like $20 and are just insanely warm and tough. Always keep it in your trunk and feel free to use it for picnics too, but if you get stuck somewhere on a really cold night, well, you know. Food And Water: Throw a few high-calorie energy bars and a gallon or two of water in your trunk while you're at it. You body burns calories for heat and needs hydration to regulate its temperature. Boots: Tend to drive around in impractical footwear? You need decent boots to walk in deep snow or on slippery surfaces. Shovel: Go ahead and pack a full-size shovel. Not a snow shovel, which tend to be quite fragile, but one of the big square-bladed heavy-duty ones. That'll allow you to break through ice or solidly frozen snow, then scoop out large chunks of it. If you get stuck, digging the snow out from around your wheels and from your direction of travel is the way to get unstuck. Kitty Litter: Throw it liberally on top of snow or ice in front of your driven wheels to give them traction if you're stuck on hard snow or ice. Warm Clothes: Keeping a few extra items in your car can be the difference between getting seriously cold while walking for help or digging yourself out and being comfortable. An old ski parka or similar would be ideal. A little work before winter can avoid major problems in winter. Go ahead and get an oil change when you put your winter tires on. Check the antifreeze and the age of the battery and the windscreen washer fluid. Squirt some WD40 into all your door locks to prevent them from freezing shut. Repair or fill any windscreen chips or cracks to prevent water from getting in there, then freezing, expanding and destroying your windshield. Keep your tires at their recommended pressures; you should be checking that every month. Make sure your exhaust pipe is clear of the snow so it can vent properly, then warm your car up while you clear any snow off its hood, trunk or roof as well as all the windows. Leaving snow on the car and lead to some major issues — like totally losing vision while you're braking — or even damage your car. Take care not to use anything hard, sharp or scratchy around your paint. 1st gear applies the most torque through your tires, so is the most likely to induce wheelspin. Pulling away in 2nd gear can help there. If you're a real man and drive a car with a manual transmission, you'll just need to slip the clutch a little more as you do this. If you're a wuss, just put your automatic into "2," or push the snowflake button next to it, which does the same thing. If you street park in the city, you may be fenced in by a berm of frozen snow left by a plow. If this is more than a couple inches high, you may not make it over or could damage low-hanging bodywork. Take the time to clear the berm completely before starting your drive. Less traction equals longer braking distances. Bear that in mind and leave a bunch of extra room behind the car in front of you and look far ahead to identify potential hazards and create a plan to avoid them before you reach them. When you do brake, try and feel for the point just before your brakes lock or your ABS engages (the pedal judders when it does). ABS works by "pulsing" the brakes on and off when you lock the wheels up with them so you're not achieving full braking force when that happens. Practice feeling for that point so you can modulate pedal pressure to keep the brakes working as well as they can, just before that lock point. Try and avoid coming to a complete stop whenever possible. If it's safe to do so, roll through stop signs at low speed, particularly when headed up hill. Overcoming the inertia of a totally-still vehicle requires good traction, which you may not have in the snow. Take turns slower. If you have good vision and there's no other cars around, try and stay to the inside of the corner, giving your car room to slide outwards without leaving the road. Look where you want to go, not at obstacles or off the side of the road. Steer where you want to go too. Catching slides really is that simple. You'll read a lot about under and oversteer and counter steering and all sorts of stuff elsewhere, but if you're not an enthusiast driver, just look where you want to be and steer there too; it's effectively the same thing. If your car begins to slide, don't react by jerking the wheel or lifting off the throttle or hit the brakes. In the vast majority of situations, just looking where you want to go, steering where you want to go and not applying abrupt control inputs will see the slide fix itself. Go to an empty parking lot on a snow day and practice all this stuff. Slides happen at much lower speeds in the snow, minimizing their consequences and maximizing your learning. As with off-road driving, the best way to get unstuck is to never get stuck in the first place. Try to avoid coming to a stop when headed up hill or through deep snow. If you feel your car starting to bog down, spin the steering wheel left and right to get yourself out of whatever rut you're digging. And, if you do come to a complete stop, don't needlessly spin your wheels; that just digs you in further. But, you do get stuck when driving in the snow pretty regularly. Don't worry, it's not a huge problem. Just grab that shovel you packed and dig the snow out from under your wheels and give each one a bit of a runway to get going. In a pinch, you can pull out your floormats and shove them under your tires for some extra traction. You can pour out kitty litter too. How much effort and time you spend digging depends on how deep the snow is and how all-season your tires are. Five or ten minutes isn't a major headache, but digging out half a city block's worth of deep snow will break your back. Don't head out if you're not going to be able to make it through and don't attempt to drive through snow of unknown consistency or depth. The most dangerous winter conditions are when the road surface is variable or the conditions unpredictable. 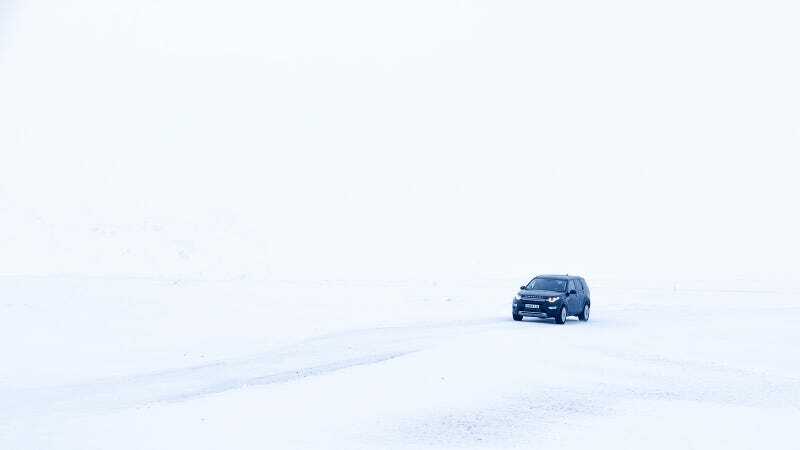 Imagine driving along and taking a corner at your normal speed — you're fine — then encountering unexpected ice or now in the corner the next time around. In which case you will very much be not fine. If there is moisture on the ground or in the air and the temperature is below or around freezing, there can be black ice. That's as slippery as regular ice, but is see-through, so you don't see it sitting on top of the black road. If you believe conditions for it exist, slow down and look out for signs of it, such as a shiny patches of road or evidence of water running onto or across the road. Only drive as fast as you can see and leave lots of extra room for braking. In short, the way to survive winter driving is to slow down. Seriously, just slow down. I know you're super important and in a huge rush, but having a car crash is going to ruin your day. Driving in the snow is fun and practicing it will make you a better driver not just in these conditions, but overall. Go find a big, empty parking lot and practice. Work on pulling away from a dead stop, panic braking and turning. Practice initiating slides — it'll teach you how they occur — then controlling them. With a little snow, you'll be doing this at low speed, so as long as you leave enough space around obstacles and curbs and whatnot, you'll be practicing in relative safety. Once you know what it feels like to slide and how to catch one and how to use your brakes to their maximum ability and not get stuck climbing hills, go out and find some real-world challenges. Start small — Sunday mornings, roads you know — and grow from there. Artificially implementing challenge is both fun and who you develop skill and confidence and test your vehicle, all beyond the circumstances you'll likely encounter in day-to-day life. Then, when you actually need those skills or confidence or you learned you needed winter tires and actually put some one, you have them. What are your tips and tricks for winter driving?